Final Fantasy creator Hironobu Sakaguchi plans to release eight titles over the next six years, Terra Battle 2 is the second of these games. 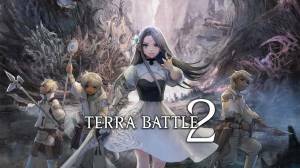 Terra Battle 2 is set in a new fantasy world and is a direct sequel to the original, it does however apart from a few connecting elements have a new plot. Terra Battle 2 has the same unique strategic party-based battle system and core battle mechanics as the original but it now also features an all-new world map which allows players to travel alongside their companions, adding another element of strategy to the title as players can now decide in which formation they enter battle. Like the original, Terra Battle 2 is an ad-free, free-to-play experience, with in-app purchases. The story levels are currently capped, with a new one set to be released each week. What are the Elemental Match-Ups?